Relishing a step up to 1400m, Hussor was a particuarly gutsy maiden winner at Ballarat on Sunday, the first leg of a winning double for the stable. Sent out a short priced favourite in the open age maiden, the three-year-old was not the best out of the gates, ending up back along the rails and awkwardly placed coming to the turn. With little room in the run home, Hussor had to weave in between runners and it was not until the very final stages that he looked like he would get up. But he did just that, showing great heart to put his nose out right where it counts. "Robbie said that if you ride him cold he can unleash a good turn of foot and he certainly showed that today," said jockey Brad Rawiller who was having his first ride on the promising chestnut. "He was just that bit awkward out of the gates, I had not wanted to be quite so far back but credit to him he really scooted through them that last bit." "You would like to think that there is a future for him." Reid Balfour admitted to being concerned during the race - "I thought it was going to be another hard luck story for him but he threaded through the needle and did a great job." "Now that he has won one hopefully he can go right on with it." 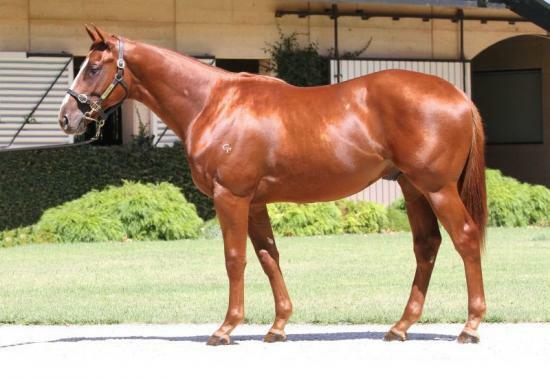 Bred by Gilgai Farm and purchased at the 2015 Melbourne Inglis Premier for $180,000, Very Dogmatic is a half-brother by Husson to the stable's Gr.1 Newmarket Handicap hero The Quarterback. A 3/4 brother to the dual Gr.2 winner Philippi, he is also a half to the recent Premier sale topping I Am Invincible colt who the stable keenly bid on only to be nabbed on the line! Hussor's dam Soorena, an Encosta de Lago half-sister to the Tasmanian stakes winner Spinning Jenny, failed to get in foal last spring but has a weanling colt by I Am Invincible.